At some point following either a laminitis episode or the diagnosis of EMS or PPID, owners will have to make decisions about whether, when and how to return their horse to pasture. Horses that can usually return to limited pasture grazing are those that were overweight, overfed and under exercised. Around 10% of ponies remain insulin resistant even after weight loss and correct management, and these can probably never return to pasture. Horses that have had repeated episodes of laminitis may also be too high risk to return to pasture. and ideally the horse will be back in work. Use a grazing muzzle - introduced correctly, most horses will accept a muzzle. Use a track system (see below). Strip graze (use electric fencing). Turn out for short periods. Turn out when sugar content in the grass is likely to be lowest, usually overnight and early hours of the morning (but beware cold nights/sunny days and drought conditions) - see Safergrass for information about grass. Turn out with a more dominant (but safe) companion who will keep the IR horse moving around. Eating a small amount of short, exposed to the sun, stressed and therefore high sugar grass can have the same results as eating a lot more long, shaded, non-stressed and therefore lower sugar grass - "lush" does not necessarily mean more dangerous, and this is probably why some horses seem to get laminitis when on little more than a mud patch. If you look at your horse's field and think there's no grass on it, ask whether you see your horse eating. If he/she is eating, there's grass!! It can be very useful to monitor a small patch of grass that the horse can't get to, either fenced off or just outside the field - if this is long but the grass in the field is short, you can be pretty certain there is plenty of grass, and your horse is eating in - horses appear to be amazingly good at eating grass, it's probably what they are best at! If you decide to let your formerly IR horse return to grazing, you will have to become a bit of a grass expert - you have to take responsibility for controlling his/her sugar intake. Safergrass run by Katy Watts is by far the best place to learn about managing grass and understanding the factors that influence sugar content (and please support Katy's work - the world would be a far worse place for laminitic horses without her research and her generosity in making this information available to horse owners). Do not assume "weeds" are low in sugar. During rehab from laminitis, horses with endocrine laminitis often benefit from turnout in a dry lot or bare paddock. Batt-Latch gate release timer - used to open gates and deliver hay nets in the middle of the night. See Swedish Horse Feeder by Alexandra Wikner. dividing the hay ration into several small haynets hung in different places, this encourages movement (so should not be used during active laminitis and/or if the feet are not correctly aligned and supported). Use haylage nets with small holes, e.g. 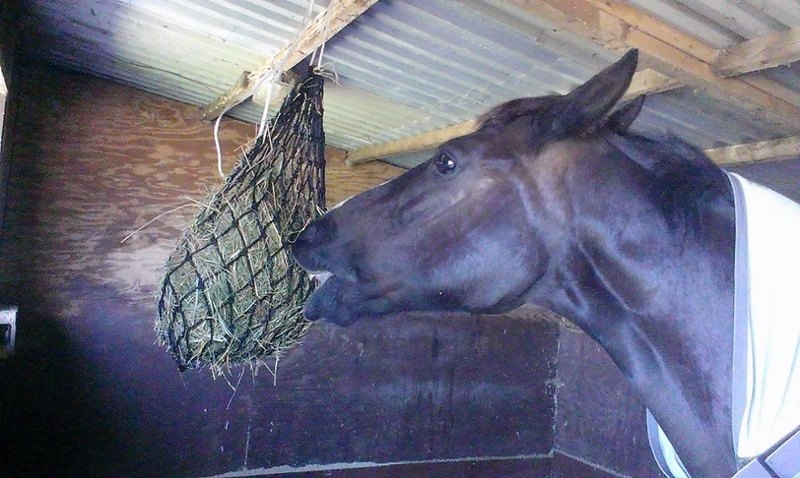 Research found that horses take longer to eat hay in smaller holed haynets - using a hay net with 3.2 cm holes meant horses took on average 6.5 hours to eat their ration, compared to 3.1 hours for presumably the same size ration when fed on the ground and 3.4 hours when using a large holed haynet. Setting up a track around a field can work really well if you have insulin resistant and non-insulin resistant horses that you want to keep together - the non IR horses can spend time in the centre of the field where there is plenty of grass, and the IR horses can stay on the track. This way they can always see each other, and will still help exercise each other and possibly even still be able to mutually groom over the fence, but with limited grass for the IR horse. Loads of information and ideas on track systems, slow feeders, haynets and a forum. Nice photos of a track system.